Ladies and Gentlemen, This is Cinerama! 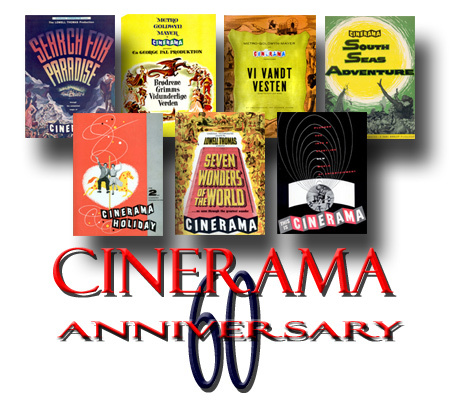 The year 2012 marks the 60th anniversary of Cinerama, the large format, curved screen cinema process which introduced peripheral vision (The "You are There" First Person experience) and 7-track true stereophonic sound to the movie going experience. The anniversary will be celebrated in a few select cinemas in Europe and in the US. The impact of Cinerama stunned audiences across the world and revolutionized the exhibition industry forever. Despite the success, however, Cinerama was a troubled film format from the beginning. The main complaint were the two "join lines" where the pictures meet on the screen, which annoyed a lot of people. But it was also expensive to film, expensive to show, and ultimately it died, to be replaced by 70mm. But unlike any other film format, Cinerama touched a lot of people and is fondly remembered to this day for its visual impact, at a time when audiences were taken around the world to exotic places in a series of travelogues. This was during the 1950s when travel was not yet a casual thing like it is today. 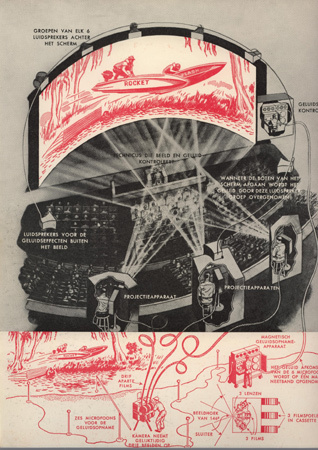 The birth of Cinerama dates back to 1939 and the World's Fair in New York when inventor Fred Waller and architect Alexander Walker established the Vitarama Corporation to design film projection concepts for dome and curved screens. Walker designed the cinema and Waller came up the projection techniques. Through research they had noticed the importance of peripheral vision in giving a sense of depth and perspective. Waller had realized "Normal human vision is actually arc-shaped. The way our eyes are fixed in our head gives us a curved view of the world around us, a sweeping arc of about 160° wide and 60° high. If a picture covering that same area were projected on a curved screen", he argued, "anyone watching it would feel as if he were right in the centre of it." Vitarama continued during the Second World War when Fred Waller devised a Flexible Gunnery Trainer. A virtual-reality device for gunners designed to practice target shooting before they went into actual air plane combat. It is estimated that more than 250.000 allied gunners lives were saved, because they had practiced on the more than 75 Waller Gunnery Trainers, which were running around the clock in the US and in England. 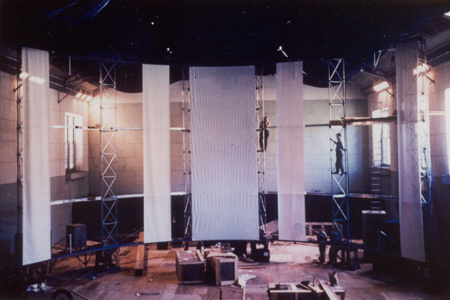 Cinerama layout with three strips of film in the camera, 7 microphones recording the live sound, and three projectors in the cinema. After the war the trainer projection system was simplified. The number of projectors were reduced from 5 to 3 and the screen went from being dome shaped to deeply curved and arc shaped. The new process intended for general exhibition was named "CINERAMA" and Richard Babish designed the first camera, 3-panels of 35mm film running in synch to photograph a 146 degree image. The three panels (named Able, Baker and Charlie) would be blended together on a huge curved screen to create a very realistic illusion of reality. To match the large and high resolution image of Cinerama, engineer Hazard Reeves designed a 7-track Hi-Fidelity stereophonic magnetic sound system of unprecedented quality. The screen - a marvel in itself - was made of 1200 separate louvers, each angled specifically to reflect light towards the audience, and not across the screen (which would wash out the contrast). The Cinerama studios, located inside an indoor tennis court in Oyster Bay, Long Island (NY), attracted a lot of visitors who were invited to see Cinerama. All the big movie studios saw it demonstrated but all dismissed it as being too complicated and impractical for commercial use. Lowell Thomas and Michael Todd, also saw it and said it was "the biggest thing since penicillin, we gotta get control of it". The first demonstration film called "This is Cinerama", produced by Thomas/Todd Productions, premiered at the Broadway Theatre in New York on 30 September 1952. An artists version of the Cinerama experience "You are IN the picture". After a 12 minute black and white prologue, the screen opened, and opened, and opened to reveal the largest screen the audience had ever seen at that time. The first sequence was a roller coaster ride, which was so realistic that many people became sea-sick when they saw it on the huge screen. It became the biggest box office hit of 1952, and it was only playing in one cinema! Such was the impact of Cinerama. 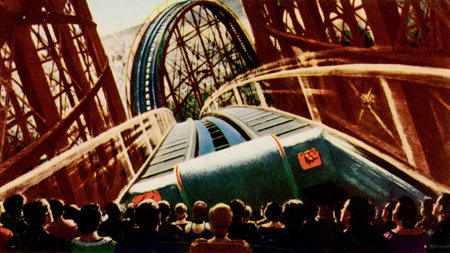 It was a revolutionary cinematic process with 3 cameras and 3 projectors which completely changed motion picture exhibition with its 3-dimensional type of virtual experience, and in the following years gave it birth to dozens of "scopes", "visions" and "ramas"
The success of the first film, made the audience hungry for more Cinerama thrills. Four "travelogues" followed: "Cinerama Holiday" (08.02.1955), "Seven Wonders of the World" (10.04.1956), "Search For Paradise" (24.09.1957) and finally "South Seas Adventure" (16.07.1958). Cinerama was a success nearly everywhere with prestige cinemas opening in all major cities across the western world. The Cinerama system and the efforts done by Fred Waller and Harzard Reeves were recognized with an Academy Award in March 1954. 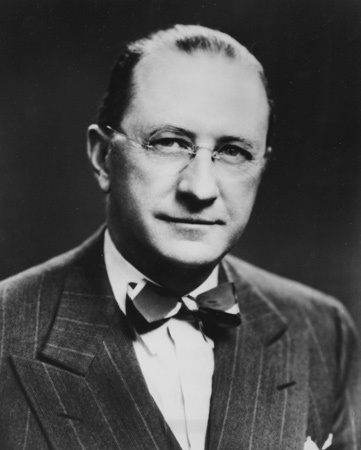 By coincidence the inventor of the Hypergonar lens, Frenchman Henri Chrétien also received an Oscar the same evening for his development of his lens and, which was the basis for a rival - but less complicated and far less expensive - widescreen process popularized as CinemaScope. The Hypergonar lens came in handy when cinema attendance was declining rapidly at the time of Cinerama’s premiere. The big studios were looking for something similar to Cinerama, but for a fraction of the cost – something with which to lure the audience back into the cinema as Cinerama could do. The answer was anamorphic cinematography, or "CinemaScope", as it was named by 20th Century Fox. And they found what they were looking for in Henri Chrétien laboratory in Nice, France. The irony is that CinemaScope was described as "poor mans Cinerama", but it is still used today under another name “Panavision”. To FRED WALLER for designing and developing the multiple photographic and projection systems which culminated in Cinerama. To REEVES SOUNDCRAFT CORPORATION for their development of a process of applying stripes of magnetic oxide to motion picture film for sound recording and reproduction. 3-strip Cinerama only existed for 10 years until 1962, culminating with the release of "The Wonderful World of the Brothers Grimm" (14.07.1962) and "How The West Was Won - in Cinerama" (01.11.1962). Two spectacular MGM dramas, which were both huge financial hits. MGM's success with Cinerama was so massive they invested in more films with the Cinerama logo attached to the posters. There was a catch, however. None of the following films were filmed in the original 3-strip process: they were photographed in the new 65mm/70mm process, with special lenses by Panavision. To 20th Century-Fox Film Corporation in recognition of their imagination, showmanship and foresight in introducing the revolutionary process known as CinemaScope. 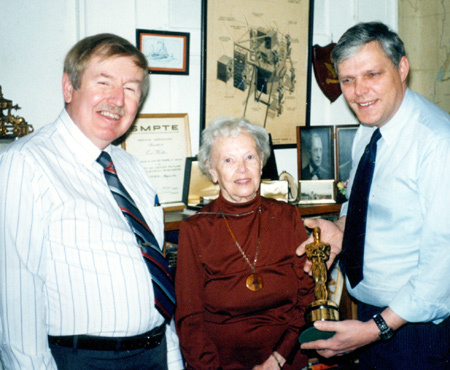 To PROFESSOR HENRI CHRETIEN and EARL SPONABLE, SOL HALPRIN, LORIN GRIGNON, HERBERT BRAGG and CARL FAULKNER of 20th Century-Fox Studios for creating, developing and engineering the equipment, processes and techniques known as CinemaScope. True Cinerama enthusiasts felt cheated, missed the impact of Cinerama and felt the system had sold out. Exhibitors and distributors were very happy to run 70mm films, which required much less labour. A string of highly popular "fake" Cinerama films were released until 1970 which included "It's a Mad, Mad, Mad, Mad World", "Circus World", "Battle of The Bulge", "Grand Prix", "2001: A Space Odyssey", "The Hallelujah Trail", "Khartoum", "Custer of The West" and "Ice Station Zebra" and a few memorable flops which includes: "The Greatest Story Ever Told", "Krakatoa East of Java" and "Song of Norway". The days of Cinerama came to an end. The last recorded 3-strip presentations took place in Paris (France) as late as 1972. After Cinerama, projectors and films often just stayed in Cinerama theatres, pushed aside to make room for new machines and platters, or until the cinema was demolished. Two Cinerama enthusiasts went the other way and built complete cinemas with projectors and sound equipment in their own homes, which they assembled from derelict cinemas across the world. They even collected old pieces of Cinerama films to be able to put together complete prints to show on their curved screens. One collector built his screen in his back yard, and the other raised his roof by 3 feet and installed a deeply curved screen in his bedroom. 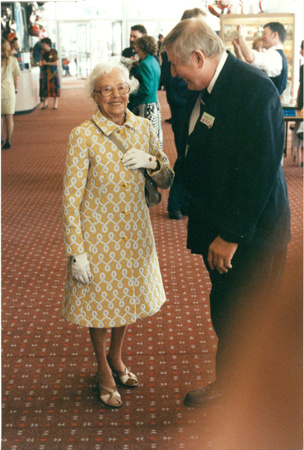 In June 1993Fred Waller's widow Doris Waller attended the grand opening of the first Cinerama installation in several decades at the Pictureville cinema in Bradford. John Harvey to the right. Image from Willem Bouwmeester's collection. In 1985 the last complete Cinerama cinema was demolished in New Zeeland. A complete set of prints, screen and projector equipment was destroyed despite efforts to save it. Out of that grew The International Cinerama Society, a group of people across the globe working together to record and collect information about Cinerama and with the simple goal to recreate a complete authentic Cinerama cinema. And indeed that happened! Thanks to the National Museum of Photography, Film & Television in Bradford (England), the new Pictureville cinema opened a Cinerama installation in June 1993 in the presence of Fred Waller's widow Doris Waller. Cinerama is not used as a production medium anymore, but the memory of it is still alive with many people who saw it when it came out. The documentary "Cinerama Adventure" (2002) chronicles the entire story of the process by interviewing fans, actors, producers and film makers. It’s a wonderful treasure trove of details and a must for all fans of Cinerama. Pictureville cinema honours the legacy of Cinerama by showing "This is Cinerama" on the first Saturday every month. Following Pictureville’s example nearly 20 years ago, the interest for Cinerama has grown and new 3-strip installations have appeared (and disappeared) in Dayton (Ohio), Seattle (Washington) and even at the prestigious Cinerama Dome in Hollywood. The Dome is managed by Pacific Theatres, the owners of the Cinerama Inc. corporate legacy. Pictureville is the home of the annual Widescreen Weekend where every film format, big and wide is celebrated. To date most of the 3-strip library, including the "Renault Dauphine" commercial and Cinerama rival "Windjammer" (photographed in competing 3-panel “Cinemiracle") have been shown on the curve. 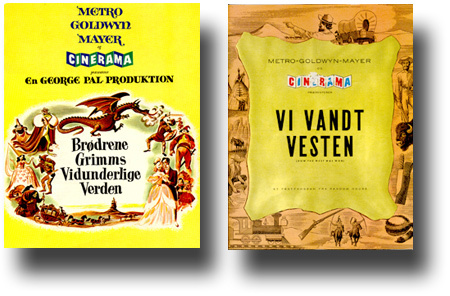 The only films not yet shown, due to the very rare availability of prints, are Cinerama's "South Seas Adventure" and "The Wonderful World of The Brothers Grimm". WSW organizers are working diligently to show both films in 2012. Digital and smiled boxed version of a scene from Cinerama's "South Seas Adventure", due to have it's world premiere during the Widescreen Weekend in Bradford, 28. April 2012. Frame by Strohmaier / Cinerama Inc. The 60th anniversary of Cinerama, and 50th anniversary of "Grimm" and "West", will also be celebrated in Hollywood during 2012 which surely will become a treasured point of pilgrimage for Cinerama fans all over the world. Cinerama may no longer be with us but thanks to the impact it made more than 60 years ago, we have wide screens and multichannel stereo sound in all cinemas today. We can all thank Fred Waller for that. 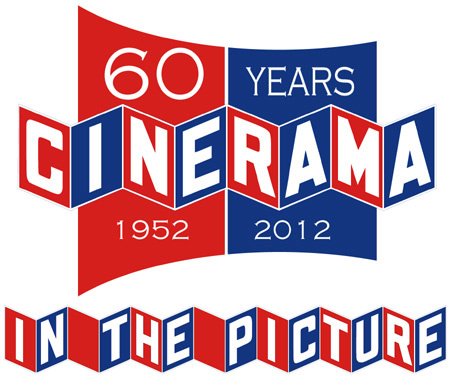 Cinerama films are expected to arrive on Blu-ray and DVD during 2012. This article was written specifically for Cinema Retro magazine, and published in December 2011. It is re-published here with permission. "Cinema Retro" is published three times a year and tells the story of the movies of the 1960s and 1970s. It is in full color, 64 pages and no adverts. 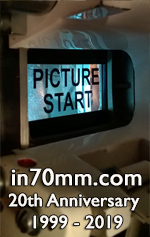 in70mm.com highly recommend Cinema Retro magazine.